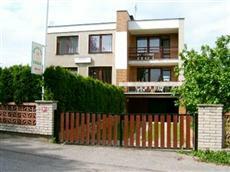 Cesar is a comfortable family oriented pension located in Braskov village near Prague. Cesar offers 2-4 bedrooms with the total capacity of 15 beds. WC's and bathrooms are for general use. Guests could not miss the nice lounge with a pretty fireplace. In the summer time, guests can relax in a swimming pool, the terrace, including grilling service. Any time you can book Pension Cesar for your anniversary celebrations, weddings,business meetings, family celebrations and more.